The holidays can be a stressful time. Parties to attend. Dinners to plan. Presents to buy. Family to visit. If it’s all becoming a bit too much, take a break! Head out of town for a day trip or spend an affordable night away in North Carolina’s foothills and Piedmont and their fantastic and fun destinations and events this year. Each locale offers a plethora of holiday goodness to reset your spirit and keep you strong through New Year! 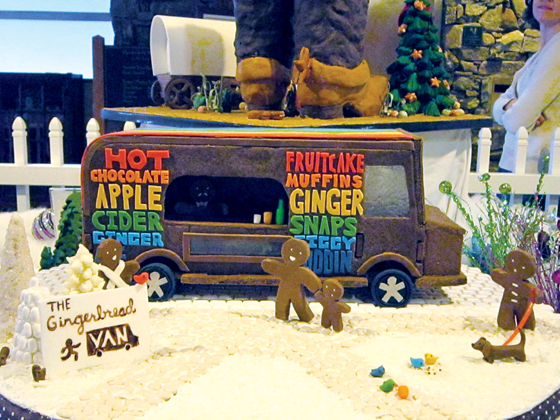 An entry in the Grove Park Inn Gingerbread Display and Competition in 2011. Photo Credit: Selena N.B.H./moonlightbulb, via Flickr. Licensed CC. 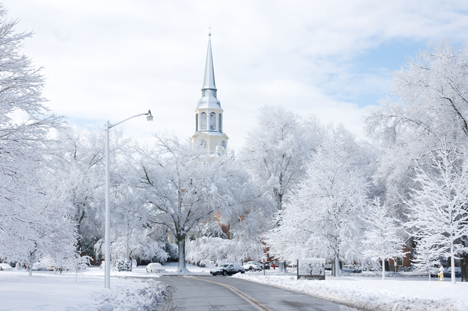 If mountain holiday charm is your thing, hop in the car and head up to the Asheville area, the quintessential holiday retreat in the hills. Of course, everyone already knows about Biltmore and Biltmore Village and it’s a sure bet for any trip. But, one might also find joy and merriment at a variety of other uniquely Asheville offerings. At the historic Grove Park Inn, stop in and check out their Gingerbread House Display and Competition. It runs through Jan. 2. Get a sneak peek at some of the contestants and learn more at romanticasheville.com/gingerbread.htm. While you’re in the mountains, why not go ahead and look for your very own, hand-cut Christmas tree! Romantic Asheville has a list of Christmas tree farms, complete with addresses, times and more information at romanticasheville.com/christmas_tree_farms.htm. Featuring crafts from local artisans, including woodwork, paintings, photography and various Christmas ornaments. A unique retelling of Charles Dickens’ classic Christmas tale. Local musicians and storytellers perform traditional holiday stories and music on Saturday mornings, with hot cider and cookies served! A new musical adaptation of the classic nativity story told through traditional and modern Christmas music. Based on the gospels of Luke and Matthew comes the musical celebration “O Holy Night.” Four powerful singers, joined by a choir and a live band, will present new arrangements of the songs that celebrate the spirit of the season. Hendersonville Little Theater present “The Gifts of the Magi”, a musical from the stories by O. Henry, based on the book by Mark St. Germain, with music by Randy Courts and lyrics by Randy Courts and Mark St. Germain. above the whitened canopy of trees. Photo Credit: almassengale, via Flickr. Licensed CC. Tanglewood’s Festival of Lights continues to be one of the largest and most spectacular light shows in the southeast. From storybook scenes to Holiday themes, over 100 displays and over a million lights fill Tanglewood Park with the splendor and joy of the holiday season. Open 6-11 p.m.
One of America’s most popular holiday gospel musicals, this annual production by the North Carolina Black Repertory Company is a foot-stomping, hand-clapping theatrical performance, filled with brilliant costumes and Afro-centric dance. The Sugar Plum Fairy casts her spell on Winston-Salem when “The Nutcracker” returns to downtown Winston-Salem. Ethan Stiefel, artistic director for the New Zealand Royal Ballet, brings his brilliant interpretation of a classic back to the Stevens Center this festive season. Experience Tchaikovsky’s lush score, vivid sets and costumes and the extraordinary performances that have made UNCSA’s “Nutcracker” a holiday tradition! A guided, candlelight tour through historic Old Salem, where the customs and traditions of a 19th-century Salem Christmas is brought to life. Includes music, food and drink. RayLen throws open its doors in true southern holiday hospitality, featuring wine and a cappella holiday caroling from Victorian Voices. Complimentary tasting of featured wines.